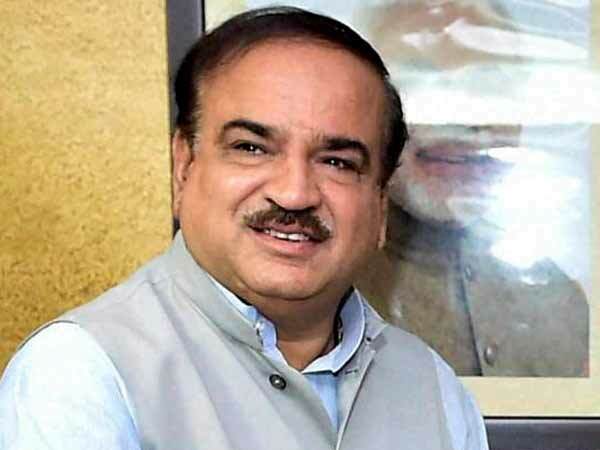 Union Minister Ananth Kumar Dies At 59. BJP leader and cabinet minister Ananth Kumar died at 2 this morning at a hospital in Bengaluru. He was 59. The union minister was suffering from cancer and had returned from the US last month after treatment at a cancer institute in New York. Mr Kumar's wife Tejaswini and his two daughters were with him in his last moments. His body will be kept at National College in Bengaluru for last tributes. He was one of the few ministers to have served in the earlier NDA government led by Atal Bihari Vajpayee. In fact, he was the "youngest" minister in the Atal Bihari Vajpayee's cabinet in 1998 and served as the Civil Aviation minister, also Minister for Tourism, Sports, Youth Affairs and Culture, Urban Development and Poverty Alleviation. "Sad to hear of the passing of Union minister and veteran parliamentarian Shri H.N. Ananth Kumar. This is a tragic loss to public life in our country and particularly for the people of Karnataka. My condolences to his family, colleagues and countless associates," President Ram Nath Kovind tweeted. Prime Minister Narendra Modi also offered his condolences to the family. "Extremely saddened by the passing away of my valued colleague and friend, Shri Ananth Kumar Ji. He was a remarkable leader, who entered public life at a young age and went on to serve society with utmost diligence and compassion. He will always be remembered for his good work," PM Modi tweeted. Karnataka Chief Minister HD Kumaraswamy said Mr Kumar made significant contribution to the country as a politician and his work made him popular among Bengalureans. "Our families had a friendship beyond politics. He always valued and had given priority to friendship. I have lost a great friend in his death," the chief minister added. A graduate in Arts and Law, Mr Kumar was associated with the Akhila Bharatiya Vidyarthi Parishad (ABVP), a student organisation of the Rashtriya Swayamsevak Sangh (RSS), before joining the BJP in 1987. A six-time MP from south Bengaluru constituency, Mr Kumar held charge of two key ministries -- Chemicals and Fertilizers since May 2014 and Parliamentary Affairs since July 2016 in the Narendra Modi government. Union Minister DV Sadananda Gowda expressed grief over his death. "Shocked, it's unbelievable. My friend, brother Ananth Kumar is no more," he wrote. Defence Minister Nirmala Sitharaman also expressed sorrow over his death. "Deep sense of grief on hearing that Shri Ananth Kumar is no more with us. Served BJP all along. Bengaluru was in his head and heart, always. May God give his family the strength to bear with this loss," she tweeted.